Raised bed gardening has garnered a lot of attention in the past few years. In their simplest form, raised beds are simply garden areas that are mounded up with sloping sides. They can be also be contained by any number of materials, or even be table like affairs that are at a height to accommodate handicapped or elderly persons that might not otherwise be able to enjoy gardening. A raised garden bed is easier to work in and maintain than a traditional garden at ground level. Raised flower or vegetable garden beds offer diversity and a visually appealing landscape. The raised bed seen to the right actually serves two purposes. It conceals a sewer clean-out riser and buries a tree stump. Raised garden beds generally have a better soil composition for heartier plants. You can adjust the soil to your needs especially if you live in an area with heavy clay, sand, or a pH imbalance. They also drain better, consequently regular watering and fertilizing is a must because the beds can dry out quickly. Raised bed gardening extends the growing season for vegetables. You can plant earlier in the spring because the soil warms much more quickly. When one section of vegetables is done producing for the year, replace it with another variety that will thrive into the fall season. Traditional gardening aids like cages and trellises can be incorporated into the raised bed to make it more efficient. Thus, a raised vegetable bed will even be more productive. The raised bed should be constructed to suit your needs. Beds for vegetables can be constructed in any shape. Rectangles or squares are generally constructed and can be any dimension that suits your gardening desires. Gardening methods such as square foot gardening fit in nicely with raised beds. 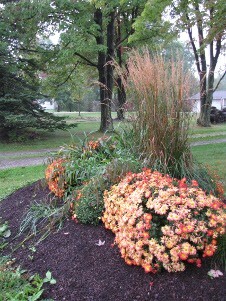 Raised flower beds or islands create a beautiful accent to the overall landscape of your yard. Terracing of the beds can also be incorporated for further effect. Place a raised bed next to the entrance of your driveway, along a path, or as a border around your patio or deck. As mentioned earlier, raised garden beds can be built a few feet off the ground and are easier for those of us with physical limitations to maintain. Weeding is less of a problem if the soil is carefully prepared. Construction material for raised bed gardening is purely personal choice. Wood, stones, or concrete blocks can be used to make the walls. There are many commercially available framing systems but you are just as well off by looking around and seeing what is available for free that can be recycled. - Framing the raised bed can help contain the soil, especially if your garden area slopes. A heavy rain can wash away soil that is not contained. Raised bed gardening has been used in this manner for centuries as people all over the word have struggled to conform the landscape into productive farmland.